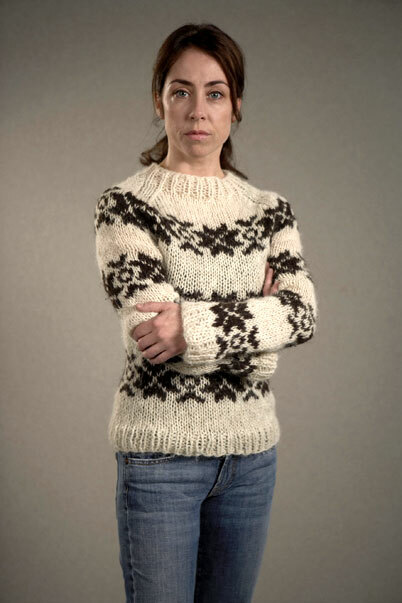 Even without a TV we have managed to catch up (just about) with the national trend of all things Danish – namely The Killing – not only a ripping good yarn but also some knitted good yarn in the form of Sarah Lund’s gorgeous sweater (first series). So, I was doubly smitten, not only because I love a good ‘whodunnit’ but also because I know a good warm sweater when I see it (this house is freezing, remember?). Initially, I thought the sweater might be just the sort of thing to appear in the shops thanks to the whole merchandising mentality that goes alongside anything even vaguely popular! However, imagine my horror (or is it just naivete?) when my investigations revealed that the sweater’s sold as an exclusive little designer number costing approximately €280 – that’s about £233! Now this may be a worthwhile investment in the spirit of having a lovely designer jumper to be worn as a statement piece, but is not a worthwhile one in the spirit of both frugality and keeping myself warm – we’re talking getting one of the smaller windows double-glazed for that kind of money! So, I found myself muttering that whole knitter’s mantra, the one that goes “I could knit that myself for a fraction of the cost” … and before I knew it, it had become a project for the 2012 calendar! I raided the internet and came up with the Nordic patterning, thanks to the knitters of Ravelry for pointing me in the direction of the kind folk who have developed a whole website dedicated to the sweater itself (yes, I couldn’t believe it either); raided my jumpers to find one that I could copy the sizing from and finally raided my yarn stash to find something suitable to knit it in – all this raiding, those ancient Danes would have been proud! Ok, mine’s red with white, largely because I am too clumsy to wear white, plus I had some lovely chunky red in my stash, and mine’s long – to keep as much of me warm as possible, so it’s not really a replica sweater, more of a tribute! 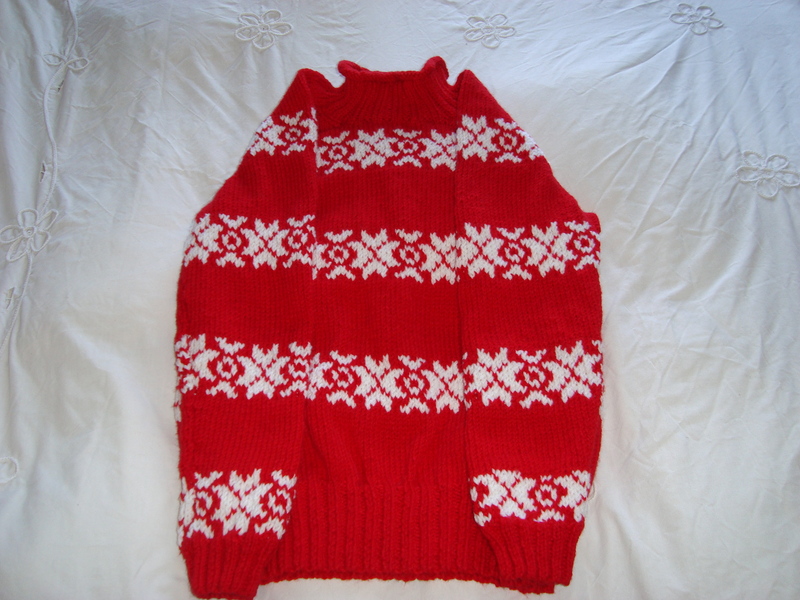 The main thing though, is that it’s actually warm as well as a fun frugal knit, using about a tenner’s worth of yarn. Ok, I didn’t use top quality yarn which I’m sure the original sweater does, and I’m not factoring in the time spent making it (not as long as you’d think though because it’s chunky yarn on big needles) but I’m pleased with it all the same!